A Youthful, Boho Take on "Hamptons Traditional"
In this four-bedroom Amagansett home, we sought to create a bright, eclectic look that feels both elegant and approachable for this family of five and the friends they love to entertain. By incorporating California-inspired touches, it is a vibrant and bohemian take on the traditional Hamptons beach home. Custom walnut built-ins are a centerpiece in the home’s design, serving as an entertainment unit in the central sunken living room, and a bar style buffet in the adjacent sunroom. The walnut cabinet we designed for the living room features artisan-level craftsmanship and thoughtfully hidden hardware that allows for the wooden doors to act as an architectural detail rather than a media console. The entertainment unit is flanked by open shelving and benches that allow for personalization, accessories, and additional storage for books and firewood. The mirror above this custom walnut sideboard reflects the Apparatus Studio Trapeze light fixture, featured in the breakfast nook. Above the sunroom (photo, left) hang three Moooi Random pendant lights. Varying sizes and staggering heights compliment the linearity of the exposed beam ceiling. The kitchen takes a traditional “Hamptons White Kitchen” concept and modernizes it with a deep blue island, herringbone mother-of-pearl backsplash and brass details thoughtfully scattered throughout the space. The sturdy, stain-proof Serena and Lily barstools make this a place for the entire family to enjoy. 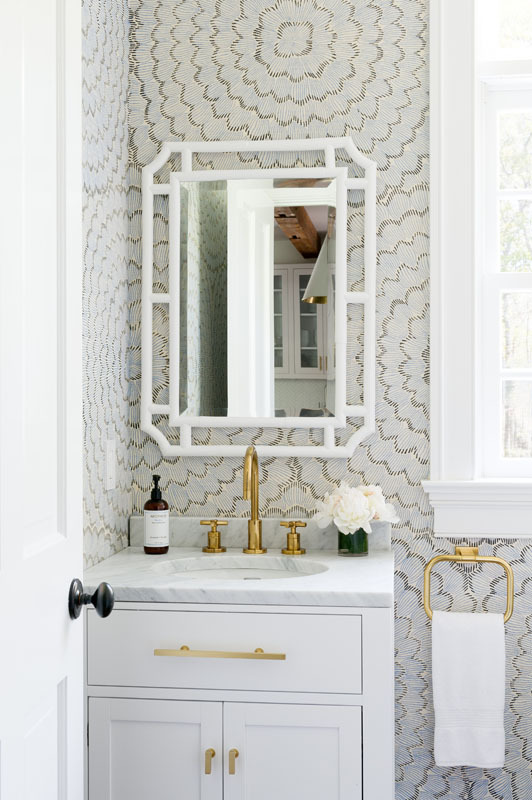 The powder room features antique brass accents and Celerie Kemble wallpaper that speak to both the youthfully modern and classically Hamptons styles that this home embodies. The children’s Jack-and-Jill bathroom features geometric Serena and Lily wallpaper that turns a shared space into a charismatic extension of the connected bedrooms. white, yet vibrant & colorful.